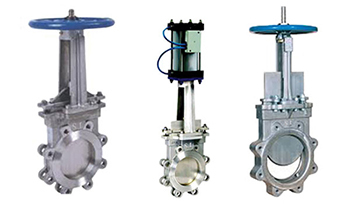 The Knife Edge Gate Valve is specially designed Industrial Valve, which makes sure that there is minimum contact between the valve parts which helps to reduce wear & tear. Usually the Knife Gate Valves are unidirectional and act as a brilliant hopper isolation valves as these valves have the ability to cut through flowing media and closed by dislodging any material in the seating area. CF8M (SS 316), CF3M (SS 316L),SS 202, ALLOY STEEL & OTHERS. - DESIGN : WAFER TYPE, ACTUATOR OPERATED, MANUAL , PNEUMATIC CYLINDER OPERATED.